Big hello and thanks for visiting the site. You may already be confused as its not a site just about balloons, well some is, but its more a broad mix of stuff that us and our friends are interested in. Having said that this time there are a few more bits about ballooning lurking about which we hope you enjoy. 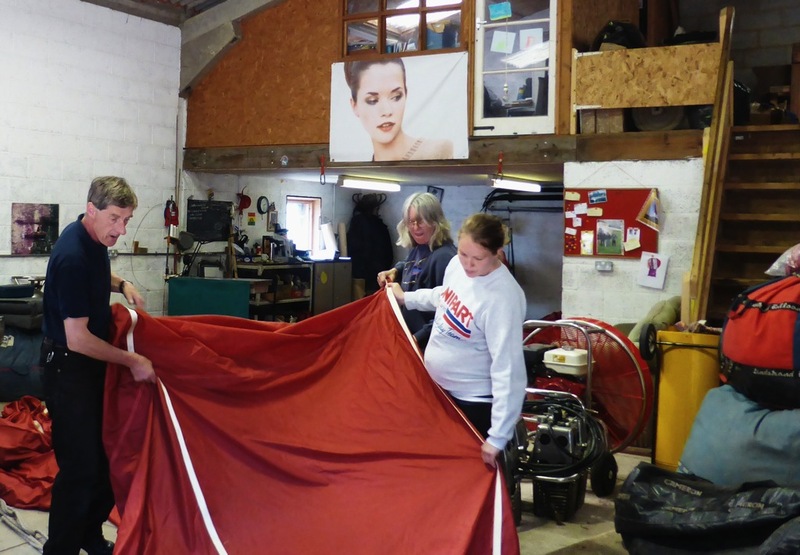 Primarily Easy Balloons is a Part M Subpart F&G Organisation looking after the continuing airworthiness of hot air balloons and through Wendover Trailers and the Balloon Repair Station (who live downstairs) mend bits that get broken from, amazingly, trailers to envelopes. In the pages bit and elsewhere is plenty of reference stuff which we endeavour to keep updated. Please feel free to use any of the material - but if you do, please add a link back to us. Thanks! Now, here’s a useful tip. If you get a hole in your envelope that needs mending you can reduce the cost by noting where it is (o: All you need do is find the number on the vertical load tape (each side of the damage if possible) then count up the panels from the bottom or down from the top if that’s easier. “Its in the red” on a Virgin 400 (for example) doesn’t really help. Now the sun has been about we are all smiles and happiness especially as our Pete’s Alice has had a boy (alarmingly just shy of nine pounds) and is now officially James Peter Dunkley. Naturally a fair amount of celebrating was done. The weekend saw a very good Coombe Hill run but a long standing injury meant John was unable to compete and the long term prognosis is that he may have to retire completely from the running and spend more time celebrating Team Swan’s success! We have had a few treats one being a trip to Northern Ireland where we were made most welcome and enjoyed two glorious days of fine weather whilst the rest of the UK were bathed in rain and murk. Luckily we managed to get the weather onboard our Easyjet and its been great ever since. We also had a splendid day out at that magical Pidley and unbeknown to us were presented with a couple of rare special shapes to inspect with a view to getting them flying again. More elsewhere. On the news front nothing much is happening apart from the sale of the Go Ballooning stuff being done and dusted and, from the comments received by visitors various, the eagerly looked forward to Queen’s Cup seems to be going down like a lead balloon on account of the enormous entry fee. Sadly well out of our pocket. Meanwhile cycling from Lands end to John O’Groats has been successfully achieved by Eccles Hall star Sean Simington in two weeks. Brilliant achievement. In the things to do department Trevor’s Vivi is about to be up and running in the very near future. The mighty Landie managed to knock out a front prop UJ but fortunately after a rather longer than planned hunt we found the front section of an old propshaft from the pickup lurking in the shed which, rather amazingly, fitted so that saved a few bob. A visit over to Paul the Welder at Booker the other week revealed that restoration of the Claud Butler has indeed been removed from me (I may get to do some painting yet) and it is well on the way to being put back to sixties speck. The two British Gas Flames have now gone back to the BBM&L and we now have a Coffee Jar to resurrect in the coming months, hopefully to airworthy condition. Incidently we have now finished the Westfalia damper article. It got held up as during a clear-up we inadvertently threw away the broken damper which we had planned to photograph. Fortunately another poorly trailer turned up and the problem was solved. Thanks again for visiting and please feel free to wander round the site. We hope that you have a good chuckle or find the information you need. If you don’t please let us know. As always please feel free to drop us a line. All the best and jolly happy flying Jane, Chris, John and Alice.